This post is a follow-up to a recent Skype with Silvia Tolisano on developing a PLN and how to build an authentic audience for student blogs. 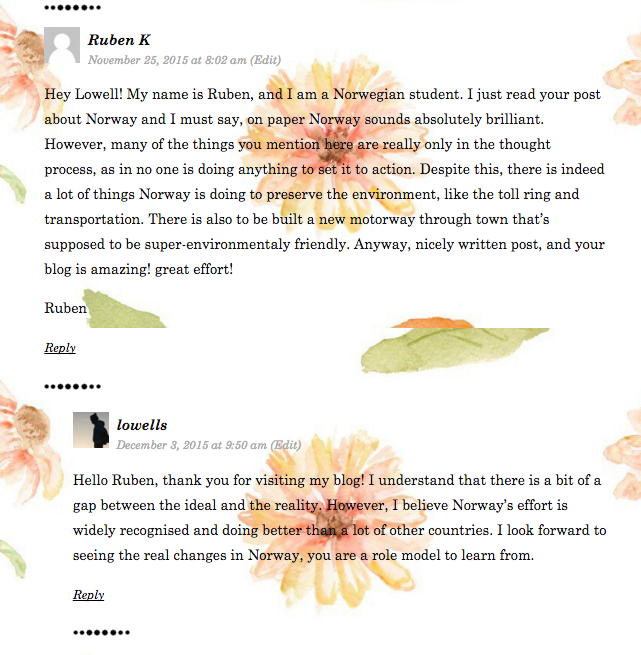 In my last blog post, I shared how a collaboration with Ann Michaelsen in Norway resulted in creating an authentic audience for my students’ blogs and for Ann’s students’ blogs as well. This collaboration developed to include Skyping so the students could see and speak, in English, to students in another country. Due to this positive outcome, in 2016, I plan to teach blogging to more subject classes and to both international and local Australian students. For my students, the purpose of these blogs will be to document and reflect on their learning. By doing this, I will be teaching modern skills and literacies: to communicate, to collaborate, to connect and for critical thinking. So teachers can see my learning content, I am also updating my blog to include my subjects and lessons to share and invite global feedback. My 2016 student blogs will include international ESL students in year 11 and 12 and year 11 Research Project students. The ESL students are from China and will be doing a variety of topics from our curriculum that I will post on my blog. The Research Project students are local and international students who will be individually researching their own chosen topics. I hope that teachers will connect with me to organise best times for student blog comments. I also hope that through connecting students will start their own PLN that will develop throughout their academic career. My subjects will start in February and end in early December. I am passionate about global connections and teaching digital fluencies and citizenship. If you would like quality comments on your students’ blogs please contact me as I have students in my other classes who are very curious about students in other countries and who love to contribute. Through sharing our student blogs, I hope to develop my own PLN with other teachers to ensure the benefits of an authentic audience for all our students. If you are interested in connecting our students’ blogs or adding quality comments on my students’ blogs please open this Google doc to see my subjects, students and topic details for semester 1. The Google doc is open for comments. Tagged Ann Michaelsen, authentic audience, blog, comments, Langwitches, Lowell, PLN, quality comments, Silvia Tolisano. Bookmark the permalink. Great to think of students connecting in this way and how I would have been delighted to have such opportunities when I was at School.